PowRyte 500145 Elite 6 Gallon Oil-Free Pancake Portable Air Compressor & 20-Piece Air Accessory Kit is ideal to support multiple trim finishing nailers, small framing/roofing jobs and all general inflation, blowing and smaller SCFM air tools. 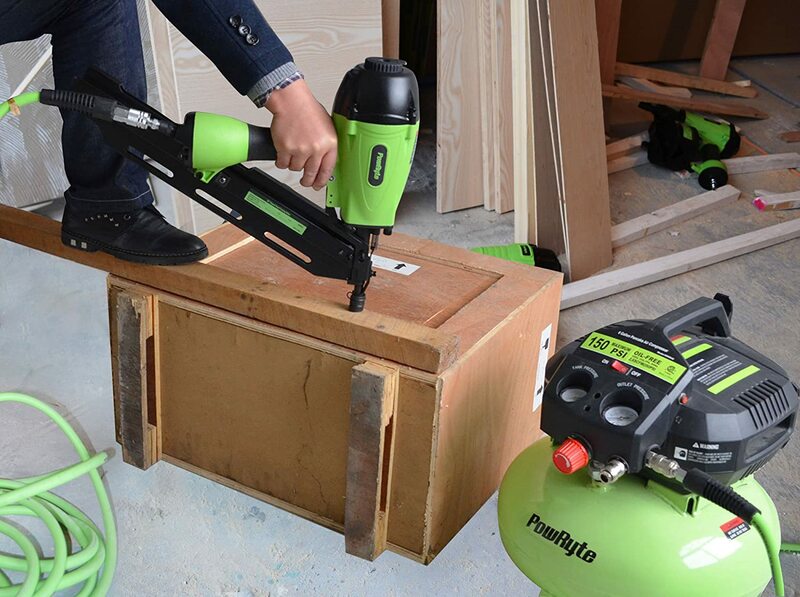 It features 150 PSI max to allow users to drive more nails and 2.6 SCFM 90 psi to allow for quick recovery. Oil-free and maintenance-free pump is for convenience. 6-gallon vertical pancake tank is for improved center of gravity and easy portability. Innovative fully packed shroud with integrated carry handle allows for better protection and easy portability. 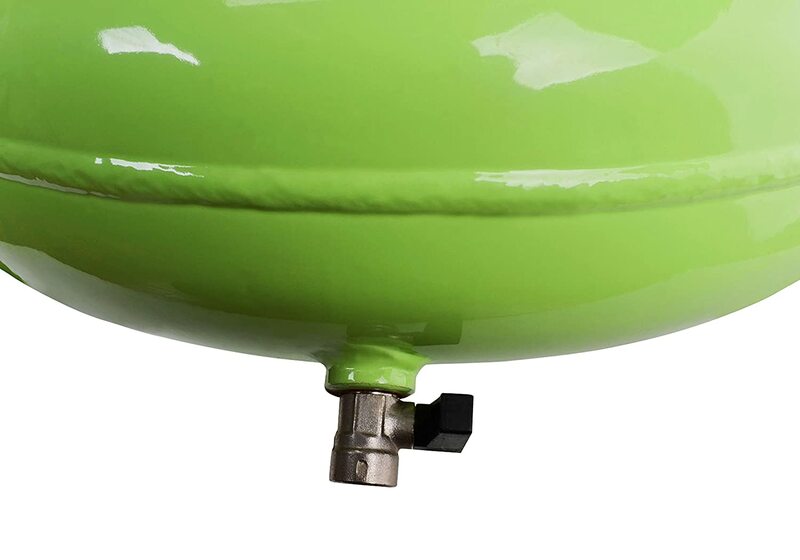 This small electric air compressor features two regulated, factory-installed air couplers to easily support two users. 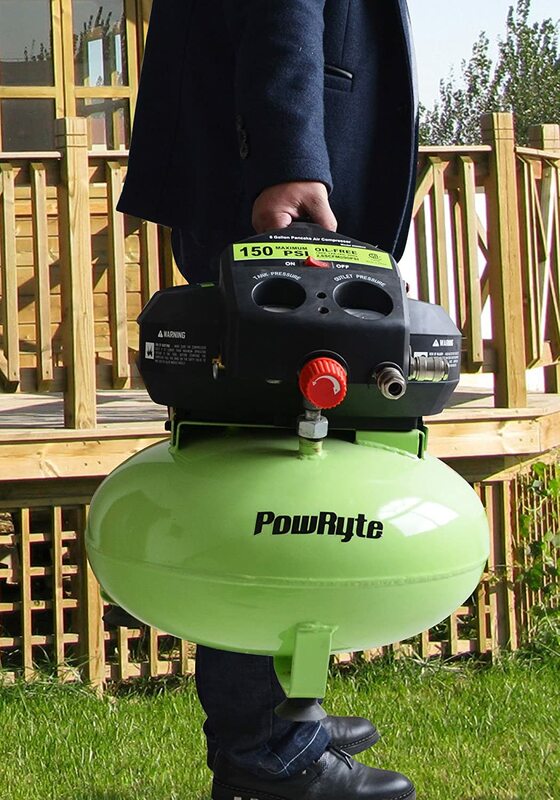 This compressor has a low-amp, 120-volt motor that starts easily in cold weather or with an extension cord. It is designed for portability at only 31 lbs. The 20-Piece Air Compressor Accessory Kit with Blow Gun is perfect for multi-purpose use, including air dusting, inflating, pressure checking, and airline connection.